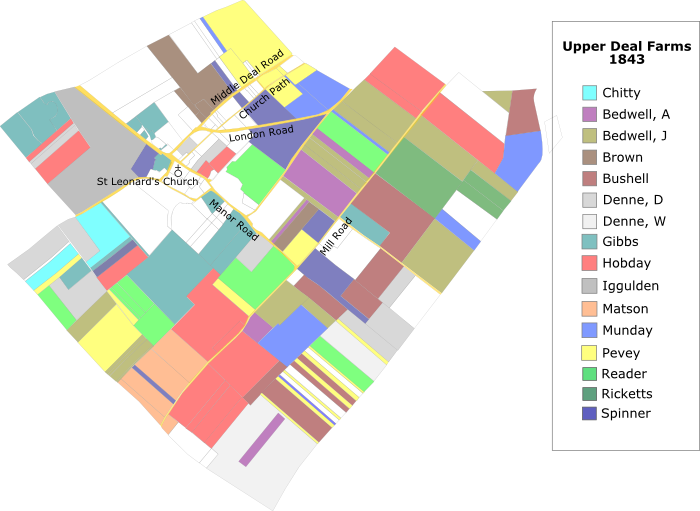 The coloured sections of each of these three maps show snapshots of farm plots in Upper Deal in 1843, 1910 and 1941, with the occupiers’ family names in the legends. These farmers also rented land in North Deal, and in adjacent parishes too, working from 10 to over 100 acres in all. The map for 1843 is based on the tithe survey made in the same year and shows 16 farms. 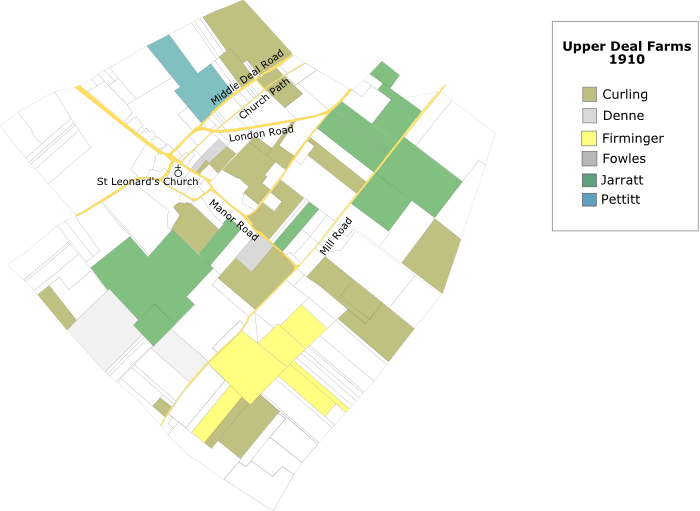 You can see how the productive land is divided into quite small plots, and how scattered the holdings are. Most of the land in Upper Deal was not enclosed by hedges, with boundary stones showing the shape of the plots. Farmers were usually tenants on short leases, though some like John Bushell and Thomas Reader owned land as well as renting from several owners. Owners’ holdings were often individually small and widespread around the parish. By the time of the 1910 land valuation survey, the number of farms in Upper Deal had dropped sharply to 5. The late 1800s were not an easy time. Foreign competition from wheat and then livestock depressed prices. With the coming of the railway to Deal, many turned to market gardening to supply London. Most farm tenancies had changed hands, with different names appearing, though Anna Denne still worked a small plot in Beer Tie that was part of her father David Denne’s farm. Frederick Curling built up a prosperous business including Crews and Neptune farms, and Charles Jarrett was a successful dairy farmer. But many owners had begun to invest in roadside land for building rather than agricultural holdings, and housing had begun to spread over the former fields along Mill Road, London Road, Middle Deal Road and Church Path. After a brief farming boom during World War I, owners invested still further in land for housing. 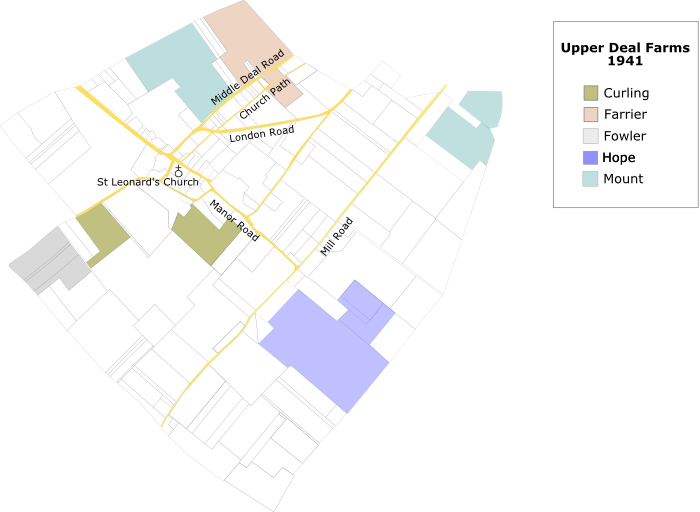 And the large housing developments for incoming miners had taken up large areas of Mill Hill. When the National Farm Survey was conducted in the early 1940s, the forms completed by the farmers showed that mixed farming was common. Most grew small fruit and vegetables as well as main crops and grass, kept livestock and used horses in the fields. Only the larger farms had invested in tractors and other types of mechanisation. The inspectors reported several of the remaining farms as ‘highly productive’. Some however seem to have been rather less successful, complaining of poor trade conditions. E W Curling, then in business as a carrier, reported that the fields remaining from his grandfather’s farm were used only to grow fodder for his cart horses, since the ‘miners trampled, and stole any other kind of crop’.